This variety is very interesting, and I will attempt to explain what can happen in breeding this color. First, I will try to define each color that occurs. They are commonly called blue slate, sometimes called a Splash, their phenotype is slate or ashy blue with specks of black scattered over the feathers. The Self Blue "aka Lavender" is also black based but have two dominant slate genes. (Genotype:BBDD), they are more of a solid, dull, grayish-blue with the hens a lighter bluish gray. The Black (Genotype:BBdd)is just that, black. Mature weights: Toms 33 lbs, hens 18 lbs. Just want to make an important note here that most of the information found on some of the more popular websites on the results of breeding blue turkeys is inaccurate, the following is the correct results . When breeding Slate to Slate, the results are turkeys of three different colors, Slate,Self Blue and Black. When breeding Self Blue to Self Blue, only Self Blues result. When breeding Self Blue to Black, only slates result. When breeding Slate to Black both slates and blacks result, with no self blues. When breeding Self Blue to Slate both Slates and Self Blues result, with no blacks. When breeding Black to Black, just Blacks result. full, normal intensity. However, to complicate matters, complete dominance does not really occur in most turkey genes, and heterozygotes ( a single dose of a given gene) often create an effect somewhere in between, With slates we get an additive dilution effect with a homozygous slate ( carrying 2 doses) being much lighter than a heterozygote. which approached "accepted" exhibition ideals tended to be heterozygous. Breeders at that time simply sorted poults by down and kept a select group for development and sold the rest. As scientists studied the genetics of slate - - Ghigi and Taibel in Italy (1929 & 1933), Walther, Hauschildt, & Prufer in Germany (1933), Jaap (1933) Marsden & Martin (1939), Jaap and Milby (1943), etc. 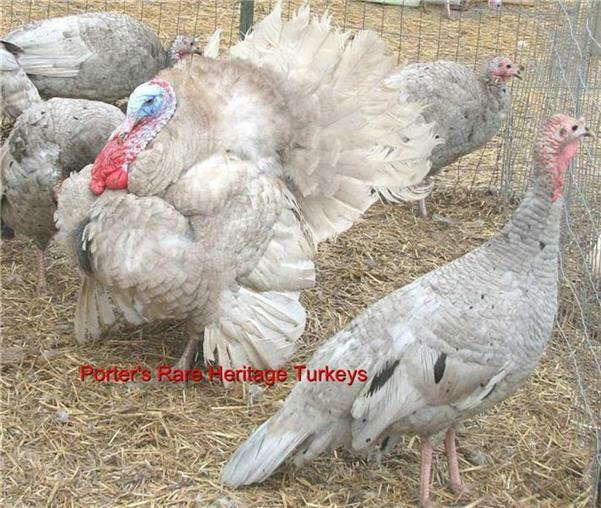 - - it was noted that the basic color pattern of a given turkey modified the expression of grey (slate) in the plumage. base, which is essentially an arrangement of mostly brown and black pigments. In areas where black is absent, the replacing color may be varying shades of yellow, reddish-tan, and brown; or even silvery-white to white, depending on what other genes are affecting the color pattern. In general, the grey (slate) does not replace the yellowish-brown or silvery-white of the basic plumage color. Therefore, brownish ("dirty") tints usually occur when the basic color pattern is bronze. As a result, slates on such a basis are not as free from objectionable color tones. have the brownish striped pattern of the Bronze clearly marked on a dark grey background. themselves) : 1 lighter slate grey. In the past, breeders would sort them at hatch and could correctly classify without error over a 1000 at a time as to future adult colors. 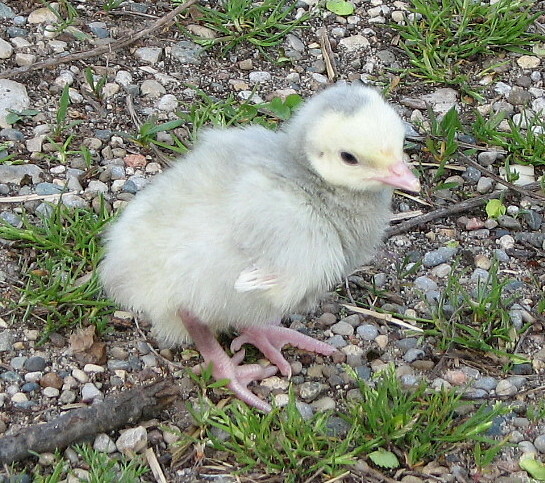 strongly resemble white poults with the creamy white down replaced by a pale grey. The head is always light tan. Rarely, faint tan stripes ( similar to the stripes of a bronze) will be observed. They are the last category (light slate grey) that segregated out in the above example. Often, certain regions of the wings and tail feathers are nearly white on mature birds. Either of these two types (slates on a bronze base) were called slates or greys by the old breeders and usually further split into lights and darks. pushed to develop slate turkeys of a more even tone, free of the "muddy"
or "dirty" appearing brownish tones. One has to remember, that during this era, scientists and breeders worked hand-in-hand. The Standard breeders supplied the scientists with their birds and shared information freely. No one else even cared about it. had much of an effect on black pigment, a movement emerged in which the bronze base slates were crossed with black turkeys. The resulting poults had the characteristic down pattern of black poults. The head and face ("mask"), and sometimes the wing tips, are at least partly creamy white; which is always sharply separated from the grey down of the adjacent areas. These poults are usually "splattered" with small randomly scattered spots of intense blue approaching black. If the original slate parents carried only a single dose of grey (slate), an equal number of black poults occurred in this initial cross. bird. But in turkeys they started calling the heterozygous bird blue splash. Regardless, breeders disliked the black flecks. edging on the feathers sometimes created an uneven, blotchy appearance, even though they were free of the flecks of the heterozygous blue splashes. Some toms were more uniform than others, and careful selection for many years by the dedicated old breeders for, or against, minor modifying factors successfully produced more uniformily colored blue strains. 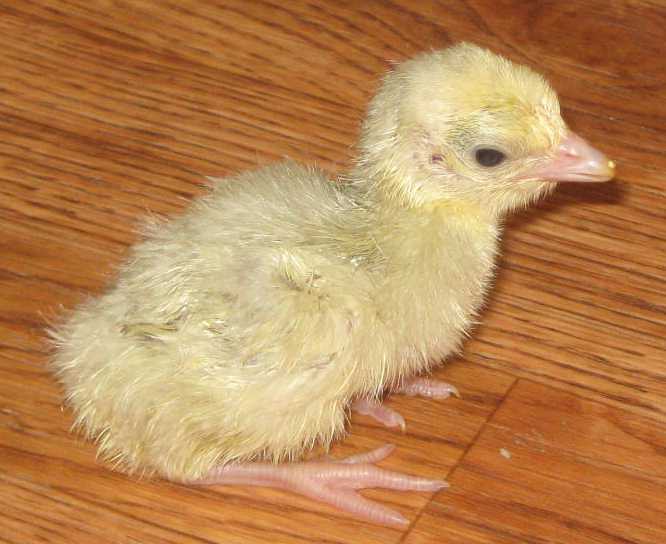 These lighter colored clear feathered strains bred true. About this time Marsden and Martins book stimulated the switch from bronze base to black base slates to fit the Standard, but in those early editions they described the Standard slates and these new blues separately while suggesting the blue would be an acceptable show slate.